Winning Smiles Orthodontics offers orthodontics to the residents in and around Washington, DC; Bowie, MD; Hyattsville, MD; Prince George’s County; Montgomery County; and Anne Arundel County. As a patient at Winning Smiles Orthodontics, you can count on courtesy and respect in all aspects of your treatment. Our superior dental team strive to answer all of your questions and concerns about your orthodontics procedure. We are a well-known and trusted provider of dental care to men, women, teenagers, and children throughout Washington, DC; Bowie, MD; Hyattsville, MD; Prince George’s County; Montgomery County; Anne Arundel County; and neighboring communities. Below is some information to help guide you through your orthodontic journey with Winning Smiles Orthodontics. 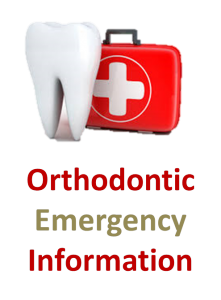 To view videos relating to orthodontic emergencies CLICK HERE! What Is Considered a Braces Emergency? When a bracket or band becomes distorted or displaced, it is not typically an emergency, unless discomfort is involved. If something happens with your braces, call any of our Winning Smiles Orthodontics locations to schedule an appointment to fix the problem. Similarly, if a rubber elastic ring or tie comes off or a wire becomes dislocated or uncomfortable, we will meet with you to correct the issue. What Foods Must I Avoid with My Braces? No gum or sticky food. This includes caramel, licorice, Now Later, Starburst, and Skittles. Avoid hard food. This includes nuts, hard candy, hard pretzels, hard tacos, crusted bread, and tortilla chips. Minimize sugar. This includes cookies, sugary soda, candy, and high-sugar fruit juices. Cut apples and carrots into bite-sized pieces. Cut corn from the cob and meat away from the bone. What Are Harmful Habits with Braces? Winning Smiles Orthodontics advises all patients to avoid chewing on ice, pens or pencils, and fingernails. All of these actions can bend or distort arch wires and other parts of your braces and may result in longer treatment time. As a rule of thumb, our patients are discouraged from picking at or playing with their braces. Also, if a food item is hard, or even sort of hard, don’t chew on it. How Do I Manage Minor Discomfort with My Braces? Over-the-counter pain medication: Advil, Motrin, and aspirin are examples of some analgesics that can help ease any soreness. Warm saltwater rinses: This process can reduce swelling of irritated gums and cheeks. The recommend amount is one teaspoon of salt to an 8 ounce glass of warm water. Topical anesthetics: These numbing gels and liquids can help with fever blisters, cold sores, irritated cheeks, or sore gums. Bite wafer: Patients bite down on this specially designed piece of plastic to minimize discomfort.